The New York City Department of Environmental Protection (DEP) today announced the completion of a $7 million project to replace two small bridges at the upper end of Rondout Reservoir in Sullivan County. The project included the replacement of the Lows Corners Bridge and Sugarloaf Bridge, which were constructed more than 60 years ago, at the same time as the reservoir. Work to replace both bridges began in May. 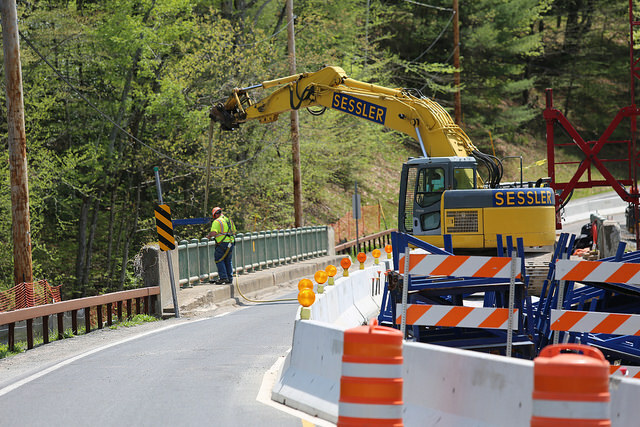 DEP owns, operates and maintains 57 bridges and 99 miles of roads throughout its upstate water supply system. The 50-foot- long Sugarloaf Bridge carries Sundown Road over the Sugarloaf Brook. During the summer and fall, DEP installed a temporary bridge at the site to allow for the complete removal and replacement of the bridge, including its footings and deck. The 150-foot- long Lows Corners Bridge carries Route 55A over Rondout Creek at the head of Rondout Reservoir. Workers replaced the superstructure of the bridge, and repairs were made to its piers. The concrete wing walls that guide water beneath the bridge were also replaced. DEP manages New York City’s water supply, providing more than one billion gallons of high quality water each day to more than 9.5 million New Yorkers. This includes more than 70 upstate communities and institutions in Ulster, Orange, Putnam and Westchester counties who consume an average of 110 million total gallons of drinking water daily from New York City’s water supply system. This water comes from the Catskill, Delaware, and Croton watersheds that extend more than 125 miles from the City, and the system comprises 19 reservoirs, three controlled lakes, and numerous tunnels and aqueducts. DEP has nearly 6,000 employees, including almost 1,000 scientists, engineers, surveyors, watershed maintainers and other professionals in the upstate watershed. In addition to its $70 million payroll and $157 million in annual taxes paid in upstate counties, DEP has invested more than $1.7 billion in watershed protection programs—including partnership organizations such as the Catskill Watershed Corporation and the Watershed Agricultural Council—that support sustainable farming practices, environmentally sensitive economic development, and local economic opportunity. In addition, DEP has a robust capital program with nearly $14 billion in investments planned over the next 10 years that will create up to 3,000 construction-related jobs per year. For more information, visit nyc.gov/dep, like us on Facebook at facebook.com/nycwater, or follow us on Twitter at twitter.com/nycwater. This story is a press release issued by New York City Department of Environmental Protection. It was not written or edited by the Watershed Post. If you are affiliated with a local government agency or community organization in the Catskills, and would like us to consider publishing your press releases, please email us at editor@watershedpost.com..